This fabulous recording includes both electronic sounds and choruses of real human singers, not sampled voices too often heard today. This is seminal space music. Also, there is great sound/text music, and vintage looping tracks as well. Listening to this makes you realize in retrospect that Jack was a pioneer. 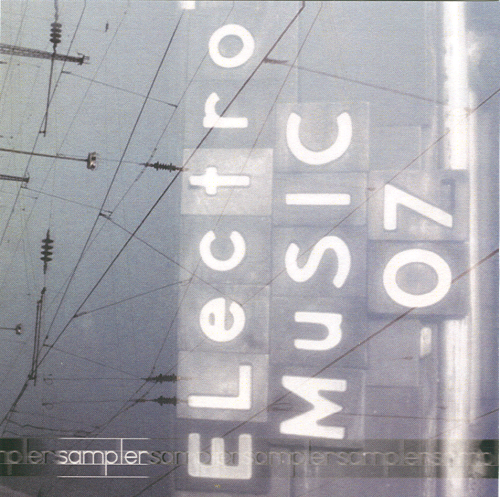 Even the liner notes by the legendary electronic music composer William Hoskins are excellent. You don't find this kind of thoughful analysis on todays recordings. 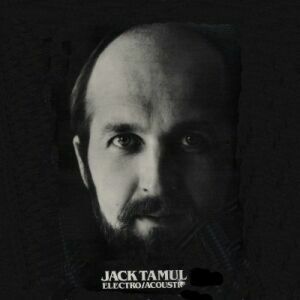 The most consistently successful [of contemporary electronic artists] is Jack Tamul, whose Electro/Acoustics (Spectrum Records [Harriman, NY 10926], SR-134) belongs basically in the contemporary classical camp. The predominant sonority on this album is a thick wash of sustained tones, sometimes rising and falling and sometimes augmented by a choir. Clearly, Tamul isn't trying to be engaging, but his results are consistent and well thought-out. Jack Tamul is among the new artists with "legitimate" credentials trying to move beyond this [contempory music] sterility to create personal visions. Electro/Acoustic merges the natural sounds of a choral group or accordion with synthesizers and tape manipulation techniques. By blurring the distinction between these sounds, Tamul moves his music to a spiritual level past theoretical considerations. 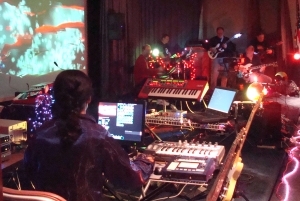 For instance, Genesis is a textural blend of droning electronics and a tape-treated chorus. The effect formed is of being in the middle of a Buddhist chant as synthesized whips of wind create a movement and ascend towards an infinity of time. The all-electronic Fantasia descends like sirens from the sky, gradually coalescing around an organ cycle reminiscent of Terry Riley's A Rainbow In Curved Air. We know that Jack is working with a contemporary record label to re-release this recording as a CD. When that happens, these vintage records will immediately increase in value. 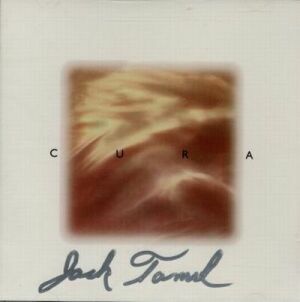 "CURA", the second offering, is a professionally manufactured CD from JTM Studios in 1997. "CURA" is a composition dedicated to the healing of the soul. The idea of soul centered music goes back to the earliest days of human civilization where it was an inseparable part of all religious and pagan ceremonies. In Greek mythology music was ascribed to a divine origin and they named the creators gods, such as Apollo, Orpheus, and Amphion. Music during that time was thought to have magical powers: it could heal sickness, purify the body and mind, and work miracles in the realm of nature. Similar powers are attributed to music in the Old Testament: the stories of David curing Saul's madness by playing the harp, or the sounding of the trumpets that toppled the walls of Jericho. Throughout our entire history, music has been used to put our soul into harmony with our lives. "CURA" is designed from a melodic curve that is used in a great majority of Gregorian Chant phrases. The melodic curve has the form of an arch; it begins low, rises to a higher pitch then descends at the end of the phrase. This simple and natural design is worked out in many varied combinations: for example some arches will extend over many smaller arches. The accumulation and repetition of the asymmetrical arches produces flowing textures that are constantly changing in rhythm and harmonic color. The mood that it creates is one of peace and tranquility.